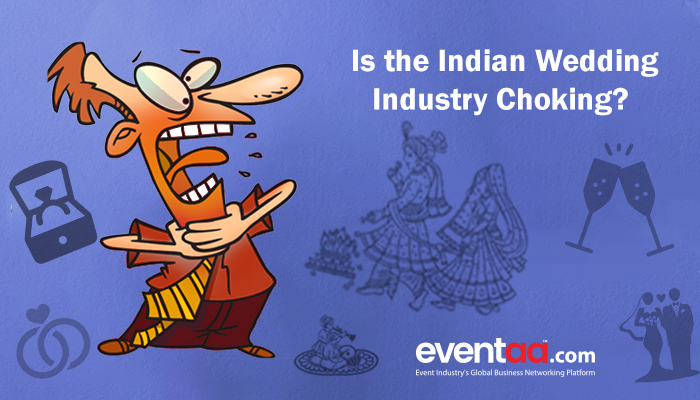 Blogs eventaa- Is the Indian Wedding Industry Dwindling? Home Blogs & Article Hindi Is the Indian Wedding Industry Dwindling? Is the Indian Wedding Industry Dwindling? Demonetisation and GST are the biggest economic reforms that hit various sectors of the Indian economy. It mainly brought enormous changes in the fields of event industry mainly the weddings. With the upcoming wedding season, one cannot help but notice that Indian wedding industry is a huge one. The Indian wedding industry is worth around Rs 1 trillion and is growing at 25 to 30 percent annually. The estimated cost of a wedding in India ranges anywhere between Rs 3lakh to Rs 8 crores and a large scale wedding would range from 10 crores to 100 crores. The aftermath of demonetization and GST might have a massive effect on the forthcoming wedding season in India. They resulted in people becoming penny-pinching and wise about spending. According to ASSOCHAM, people will have to shell out more on buying jewelry and apparels, at salons and beauty parlors, photography, even for hiring venues like hotels/marriage palaces, courier, and other related services. The average cost of services like shopping, tent booking, catering, etc. has gone up post-GST rollout as most of them attract higher GST rates between 18-28 percent, which was not the case earlier. Before GST came up, these wedding business services were using unregistered bills on which no tax was levied. With families going through their wedding budgets considering the cash crunch that occurred after demonetization and increase in prices, this wedding season does not seem to be a cakewalk for the Indian wedding industry.